The sun began to set on the golden wabbits and all was quiet – or so it appeared. "I saw a Skuttle," said Wabsworth. "But only one," said the Wabbit, "and I also saw one of the Euls." "Curses on their pointy ears," grimaced Wabsworth. "Did you spot an Ice Mouse?" asked the Wabbit. "I did," said Wabsworth. "It seemed hardly worth a mention." 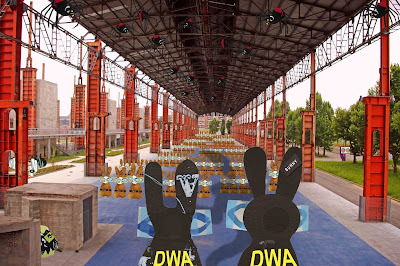 "They’re a spent force," said the Wabbit. "Look Wabsworth, all this is just noise, mere static." They watched the sun paint the girders orange. "I saw a golden wabbit move," said Wabsworth. "A trick of the light," said the Wabbit. "I’m an android," said Wabsworth, "and the light can’t trick me." "If you stare at anything long enough it seems to move," smiled the Wabbit. "My advanced circuitry takes care of all that stuff," said Wabsworth, "and I insist that something moved." The Wabbit tried to look sceptical. "Look at these two golden wabbits at the front," said Wabsworth. "They glanced at each other." Wabsworth stopped talking and stared at the Wabbit. His positronic brain raced and then he too smiled. "Yes," he said, "I understand." They both nodded in mutual satisfaction. But suddenly a dark shadow fell across the golden wabbits and Wabsworth stiffened. "Shall I be the one?" he murmured. 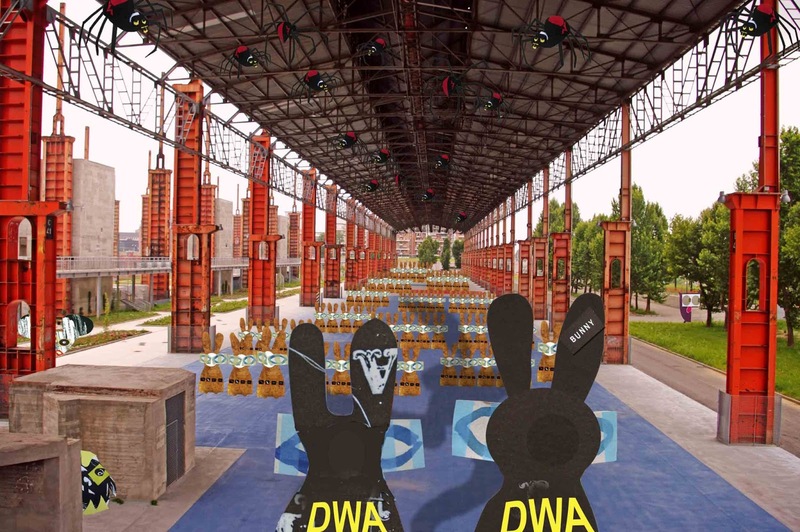 "You do it," said the Wabbit calmly. Wabsworth threw back his head and with his loudest voice he yelled "Go! Go! Go!"